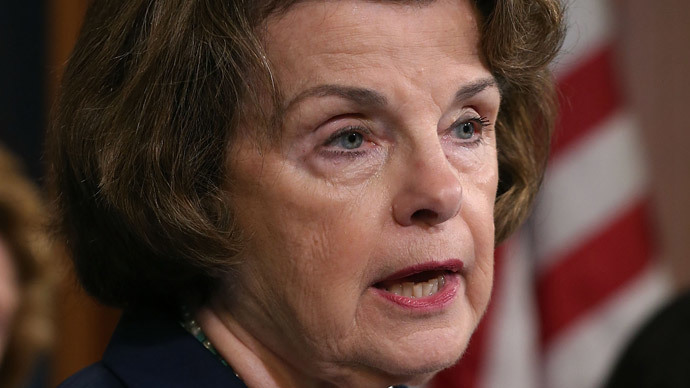 Fresh off releasing a long-delayed report on the CIA’s post-9/11 use of torture, Sen. Dianne Feinstein (D-Calif.) is now pushing President Barack Obama for further changes to ensure the tactic is never used again – a package that includes legislation. In a letter to President Obama dated December 30 but released publically on Monday, the top-ranking Democrat on the Senate Intelligence Committee outlined a variety of administrative actions the White House should take to stop torture from being employed in the future. Other legislative changes Feinstein intends to propose include limiting the types of interrogation tactics employed by the United States to those specifically outlined in the US Army Field Manual, as well as prohibiting the CIA from indefinitely holding detainees. As noted by Feinstein, some of the changes would etch into law action already taken by President Obama in his executive order banning the use of torture. She also recommended implementing other administrative actions – such as expanding and improving oversight and accountability – and videotaping national security interrogations. According to the Associated Press, Feinstein actually introduced legislation back in 2009, but decided to wait to push for its passage until her committee’s full report was made public. "We didn't know then that the study would not be completed until the end of 2014, so we went down the track of the investigation with the idea that recommendations would follow from what we found," David Grannis, the senator’s intelligence aide, said in an email to the AP. Chances for any congressional action remain slim, though, since Republicans have taken control of both the Senate and House of Representatives. Aside from notable exceptions such as John McCain (R-Ariz.), most GOP lawmakers have defended the CIA and its interrogation methods. Publication of the senator’s letter comes weeks after the torture report was finally released. In it, the Senate committee found the CIA engaged in multiple abusive tactics, including waterboarding, sleep deprivation, and rectal feeding. The Senate report, based on the CIA’s own internal documents, declared that torture did not reveal any significant intelligence information. Regarding Feinstein’s letter, the CIA said it is already implementing internal reforms after noting criticisms from the Senate report.